The Bay of Islands offers some of New Zealand’s most breathtaking natural surroundings, making it a perfect camping destination for lovers of the great outdoors. With a robust array of holiday parks spread out across the region, there’s no shortage of excellent spots to pitch your tent and engross yourself in the natural wonder around you. Entering the Bay, you’ll get an unrivalled taste of New Zealand’s distinct native atmosphere and aroma. Whether you’re eager to go for a swim or trek through the bush, the Bay of Islands offers a relaxing way to explore the country’s natural beauty. You’ll also get the benefit of being close to all of the best activities, whether you’re keen to hit the beach, go game fishing, or even just hop between the many amazing restaurants and cafes. If you’re the kind of person to make trying all of the local cuisine a big part of your holiday, then there’s no shortage of incredible culinary options conveniently dotted around the Bay for you to enjoy. Speaking of food, if you want to save a bit of cash you can always prepare some simple and delicious recipes to bring along on your nature walks or even just cook from the comfort of your scenic campsite. Since you’ll likely be doing a lot of walking around the Bay’s incredible natural landscapes, you’ll want to make sure your body is well nourished. 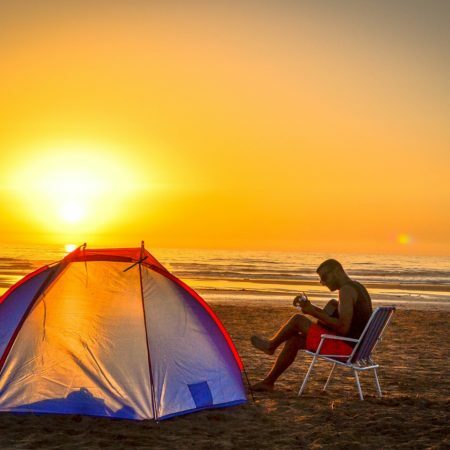 But the real appeal of camping in the Bay is that you’ll be closer to all of the incredible flora and fauna residing around the region. New Zealand has some of the world’s most unique species of plant and animal life because of its relative isolation from the rest of the world. Historically, New Zealand’s forests have been home to an impressive array of bird species, with many having evolved to become flightless due to a lack of natural predators. Unfortunately, with human encroachment, many of these species have since become extinct, but this has led to a robust conservation effort in order to protect those that remain. The Bay of Island has some of the country’s most successful bird sanctuaries that give you the opportunity to see species of bird that may have disappeared otherwise. The Grey-faced Petrel, North Island Robin and New Zealand Dotterel are just a few of the fantastic birds you can see here. Around the islands, bird enthusiasts may spot the iconic Brown Kiwi and Little blue penguin as well as other species like the Kaka and Shining cuckoo. For a comprehensive list of the bird life that’s discoverable in the Bay of Islands. 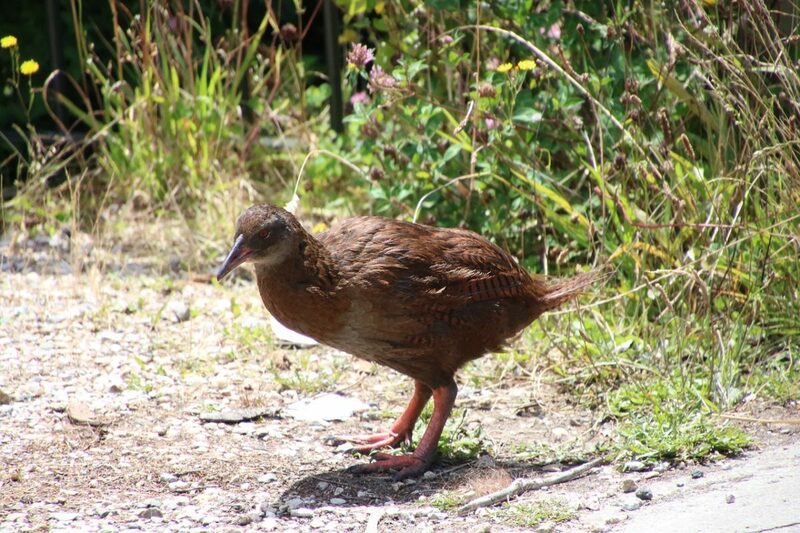 The Weka is an icon in the Bay of Islands that may be found in the bush or brazenly stealing from your picnic! The Weka. Watch out for your food, they are sneaky! Of course, no trip to the Bay is complete without checking out the marvellous array of native and migratory marine life. Due to its secluded waters and subtropical climate, the Bay of Islands is one of New Zealand’s best destinations for those eager to see dolphins and whales. Bottlenose dolphins, common dolphins, long-finned pilot whales and orcas are commonly sighted most of the year while the Bryde’s whale can be a little more elusive. Migratory whales are most commonly seen in March, April, August and September. The New Zealand fur seal is also frequently seen in the water or amongst the rocky coastline. For those keen on snorkelling or fishing, the Bay is renowned for its array of large game fish and the world’s largest stingrays. The Bay’s mix of sunshine and rain has meant that the region maintains an incredibly diverse spread of lush plant life. The majority of species of flora are actually native, meaning that you’ll get one of the most authentic experiences of pure New Zealand vegetation. First-time explorers will be stunned by the sights, smells and sounds of the ancient native forests and bushland around the Bay. The country’s largest native tree, the giant Kauri, is common all around the Bay of Islands and is really something that you need to see in person to truly appreciate. There is plentiful undergrowth to see and appreciate including ferns, shrubs, lichens and mosses. The Bay also has an abundance of the Pohutukawa (New Zealand Christmas tree) which is distinctive because of its red flowers that bloom in summer. Waterfalls are abundant in New Zealand, and the Bay of Islands has a great variety of options ranging from graceful to thunderous. Some of them may take a bit of a walk on foot to get to, so make sure you’re aware of the fitness level of everyone in your group before starting out. In Paihia, Rainbow Falls is a particularly picturesque waterfall that’s easy to access for just about anyone, only taking 10 minutes to walk there and back. Haruru Falls, sharing its name with the historic nearby settlement, translates to “big noise” and according to local legend has a water monster known as a taniwha living in the lagoon underneath. Kerikeri also has Wharepuke Falls which is about a 40 minute walk but well worth the extra effort. There’s also a popular swimming hole there that’s perfect to visit in the summer. As you might have guessed, the Bay of Islands has its fair share of beautiful beaches which are rated as some of the best in all of New Zealand. Whether you want a calm, wide beach, a wilder and windier one or a remote cove – there’s something for everyone. It’s safe to say that if you’re a nature lover, you’ll be absolutely spoilt with discovery and adventure on your visit to the Bay. This region is simply unrivalled in terms of the opportunities it gives explorers and wildlife enthusiasts. Remember to save a lot of space for all the photos you’ll be taking and always be respectful of the land you’re lucky enough to get to experience. After spending a few days here, you’ll want to extend your trip just so you can experience everything there is to offer.